One minute, you’re staring at a plate full of salad…the next, you’re hiding in the pantry scarfing down a box of cookies, chips or the like. Do you feel like you know what you need to do to be healthy, BUT you can’t seem to follow through and you aren’t sure why? I have been exactly where you are, and I 100% understand and feel your pain and frustration. How would you like to end the addictive cycle of emotional eating, stop the cycle of self rejection and create the mindset AND body that you love! 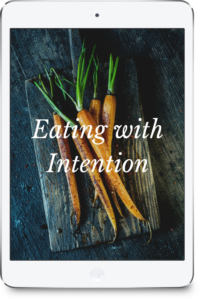 Your Eating with Intention group program is here to help you do just that. What’s your Brain health have to do with it? Learn how certain foods inflame the body and causes weight gain! Throughout our sessions together, we will move deep within to jumpstart your healthy habits and set you on the path you desire. We will implement small changes over time to help you reach your goals. I am here as your advocate. Together, we create a personalized plan of action that is realistic and achievable for you. Your health and weight loss goals will become a reality with guidance to implement changes that work with your lifestyle and your specific brain type. You have my full support and this group offers a foundation to lead you into the success that is lasting. Are you finally ready to achieve the level of health that you’ve desired? If you are ready to leave self-judgment, exhaustion and less than amazing in your past, this program is for you! Join me today for this 4-week group coaching program! The Cost is only $97.00, and we will meet for 4 consecutive Wednesday evenings beginning January 10th, 2018. All calls recorded and sent to your inbox. !